The NEX-FS700 is a 4K-ready NXCAM camcorder with a superior Super35mm CMOS sensor, super slow-motion capability and an interchangeable E-mount lens system, offering unrivalled flexibility and creative expression. Sony NEX-FS700 is equipped with a new 4K Exmor Super 35 CMOS sensor (Total 11.6 million pixels) capable of cranking at up to 960 frames per second. This high-speed readout chip is optimized for motion picture shooting, producing exceptional image fidelity with high sensitivity, low noise and minimal aliasing. The FS series camera’s E-mount is designed to accept virtually all 35mm SLR, DSLR and cinematography lenses, with the use of simple, inexpensive third party adapters sold separately -without optical degradation-. FS series camera owners are able to continue to use their existing 35mm lenses and add more lenses without being limited to a particular lens brand or mount type. The NEX-FS700 started as a 4K sensor Super 35mm camcorder capable of a vast array of high frame rate (HFR) and recording options to the superb on-board AVC-HD recording capability. The NEX-FS700U now features an upgrade that enables full 2K RAW up to 240fps or 4K RAW up to 60fps recording to Sony’s AXS-R5 RAW recorder. This “open architecture” update also enables 2K & 4K recordings onto compatible third party recorders. Upgraded NEX-FS700 camcorders now record Linear RAW with 12-bit precision to the HXR-IFR5 RAW interface plus AXS-R5 memory recorder (sold separately). This system enables continuous, FULL 2K resolution recordings at: 23.98, 25, 30, 50, 60, 100, 120, 200 & 240fps. 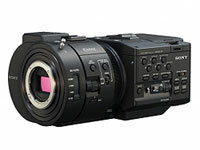 It is also capable of continuous FULL 4K RAW recoding at: 23.98, 25, 30, 50 & 60fps. This system can also record 120fps at 4K resolution in 4 second “bursts” that result in 20 second at 24fps. It is possible to simultaneously record to the AVCHD format (except HFR mode). Convergent Design’s Odyssey 7Q records 2K, uncompressed: Cinema DNG up to 240fps and 4K DPX up to 30fps when connected to the FS700. The upgrade also enhances other key creative controls; increasing the camera’s ISO range; from 320 ~ 20,000 to 320 ~ 64,000. It also adds S Log2 and 800% 709 gamma curves widely enhancing its exposure latitude HD capability. - E-Mount Interchangeable Lens System, compatible with Canon EF and other lenses with simple inexpensive adapters. Video Signal NTSC color, EIA standards HDTV 1080/60i, 1080/60p, 720/60p specification.